Effective approach to teaching letters to young children. 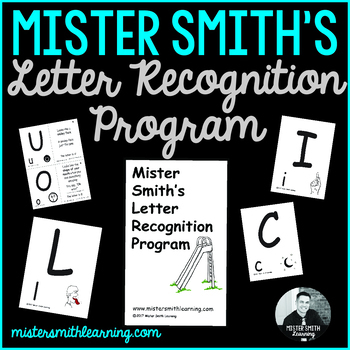 (Letter Recognition, Alphabet Identification) Flashcards are set up with letter and association picture on the front and an explanation of how to teach on the back. This program starts with "easy" letters first and builds off of success. The flashcards come with a set of guidelines. 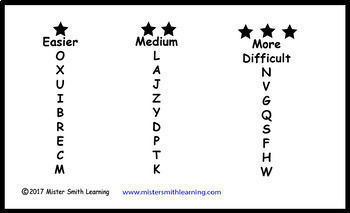 (or read below) Each letter is grouped into either the "easy", "medium" or "more difficult" level. (The exact order can be viewed on one of the preview pics) This approach is perfect for children who are in preschool or kindergarten. They can be used one on one or in a small group. The techniques used are based on simple visualizations of the letter that translates into the letter name using a mixture of mnemonics, rhyming and other memorization techniques. When teaching the letters, we want to teach directly to the letter, not to the associated picture. We want to make a direct connection to the visual of the letter. When teaching, I do this by covering the picture with my hand. This program was designed to build on the child’s success. Once they see how they can be successful, it will motivate them to continue. Start with the “easier” letters and progress to “medium” and then “more difficult”. Discourage the child from guessing. They can either state what the letter looks like, a relationship, association or a movement or say I don’t know and the teacher will respond with a positive tone. Knowing that they don’t know is actually knowing something. If they know what it looks like, a relationship, association or movement. Reinforce and relate it to the letter. 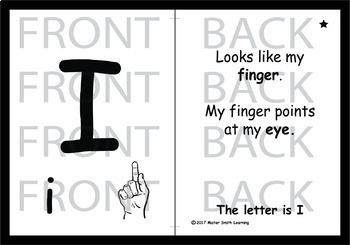 Everytime the letter is in front of the child we can help reinforce what the letter looks like. These are teachable moments. If they don’t know. Reinforce what it looks like/relationship/movement or story associated to the letter. When you show the student the letter, ask them what it looks like or what it reminds them of. If they give you the letter-great! If you ask them what letter it is, sometimes this will encourage guessing. Be aware of that. Use things related to the child when it seems appropriate like the beginning letter of a child’s name, siblings name or even a friend’s name. When practicing use the letter pictures only as a guide or reminder for students close to remembering. Be animated enough for the student to buy into your story. They will buy into it. Like when they hear and see that your house is at the end of an N shaped road, they will remember that. This program should bring out the natural teacher in you. Letters are easy to keep track of and assess. It is recommended to do a quick assessment at the beginning and at the end of each session and try to keep track of the letters that you focused on in that session. I suggest using a two pile system. Place the ones they seem to know in the strong pile and the ones that they struggle with in a weak pile. Work on improving the weak pile. Sessions should be about 10-15 minutes at one time, but can be done several times throughout the day. I suggest introducing no more than 8-9 letters at a time and for some children, as low as 3 at a time. You are the teacher. Use your natural teaching instinct. I am excited for your child’s learning experience and your experience while being the teacher. Please go to your My Purchases page (you may need to login). Beside each purchase you'll see a Provide Feedback button. Simply click it and you will be taken to a page where you can give a quick rating and leave a short comment for the product. Each time you give feedback, TPT gives you feedback credits that you use to lower the cost of your future purchases. Thank You! Copyright © Mister Smith Learning (Jesse Smith). All rights reserved by author. This product is to be used by the original downloader only. Copying for more than one teacher, classroom, department, school, or school system is prohibited. This product may not be distributed or displayed digitally for public view. Failure to comply is a copyright infringement and a violation of the Digital Millennium Copyright Act (DMCA). Clipart and elements found in this PDF are copyrighted and cannot be extracted and used outside of this file without permission or license. Intended for classroom and personal use ONLY.